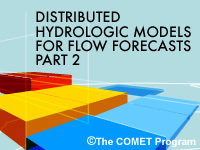 Distributed Hydrologic Models for Flow Forecasts Part 2 is the second release in a two-part series focused on the science of distributed models and their applicability to different flow forecasting situations. Presented by Dr. Dennis Johnson, the module provides a more detailed look at the processes and mechanisms involved in distributed hydrologic models. It examines the rainfall/runoff component, snowmelt, overland flow routing, and channel response in a basin as represented in a distributed model. Calibration issues and situations in which distributed hydrologic models might be most appropriate are also addressed. it is a very good lesson to improve our knowledge. Good introduction to distributed hydrologic model. Good instructor and excellent graphics. An interesting and straight-forward summary of the subject. A very good & knowledgable module with audio.